Officially the highest village in the Var department at 1097 metres above sea level it is not surprising that Bargeme has stunning views across the region - but there is more to the village than views and Bargeme is also officially classified as one of the 'most beautiful villages in France'. 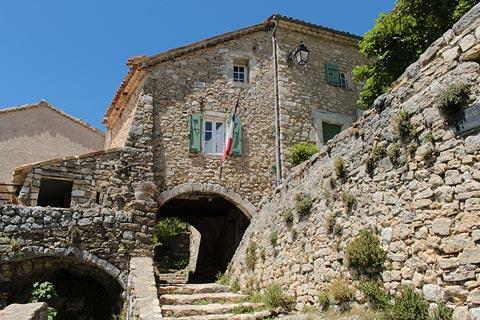 A small village, and very quiet outside the summer season, Bargeme is well worth the detour if you are visiting the region - although getting there does take a while because it is in quite a remote location. 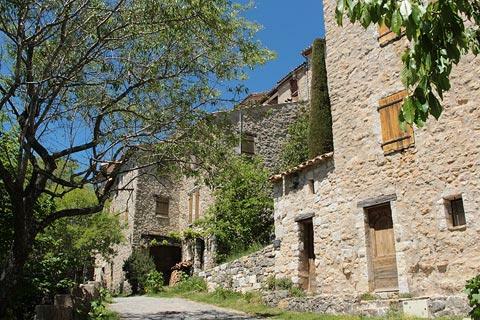 The views and unspoiled character of the village well merit the detour! 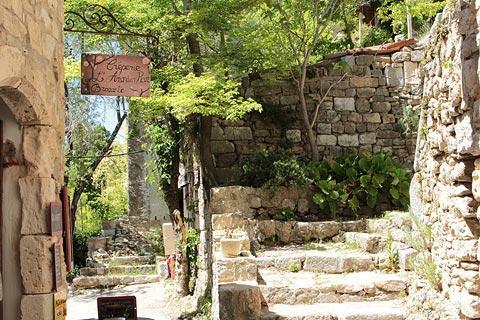 You can enter the lower part of the old town through a large stone entrance which passes through a remnant of the towns fortifications. 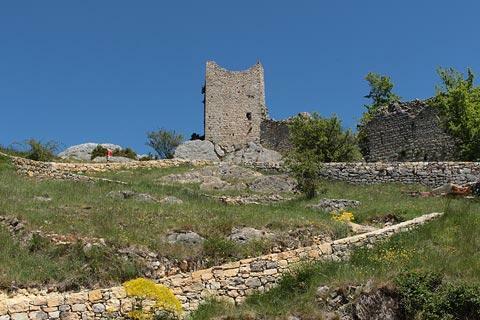 You will see a substantial amount of these old fortifications - it is hard to believe that several hundred years ago this isolated and remote village needed such imposing defences! 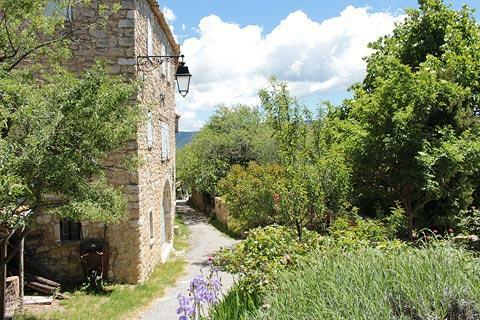 From here stroll up the hill through the quiet streets and vaulted passages that pass through Bargeme, passing traditional old houses, stone walls and small gardens. 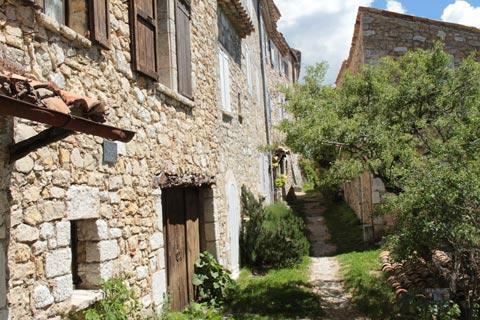 Although it is small, this village centre is very lovely with many plants and trees next to the cobbled paths. 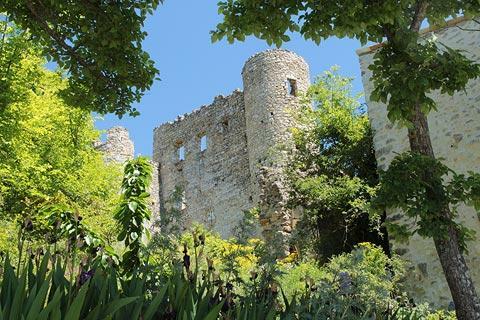 In the centre of Bargeme there are many plants, some wild and others planted, that add greatly to the charm of the centre although some of the gardens were rather overgrown. 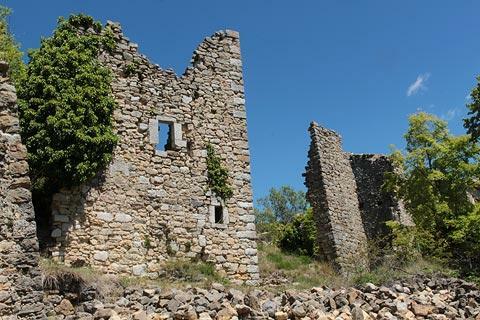 The ruins on the edge of the village become more covered in undergrowth until you decide you have explored enough! 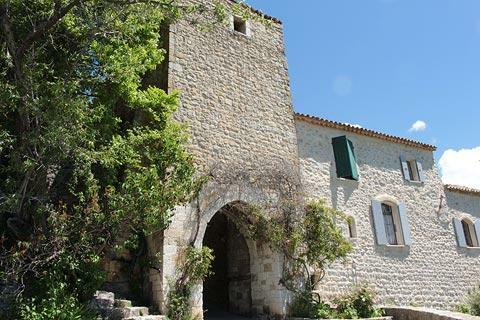 There is a centre to the village where you can see the town hall and the church. 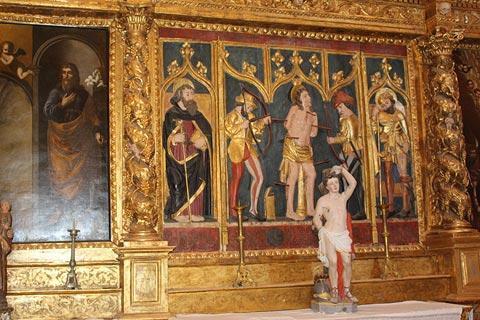 The church of Saint-Nicolas is in the roman style, and inside there is a grand golden altar as well as some interesting painted reliefs representing the crucifixion of Saint-Sebastien. 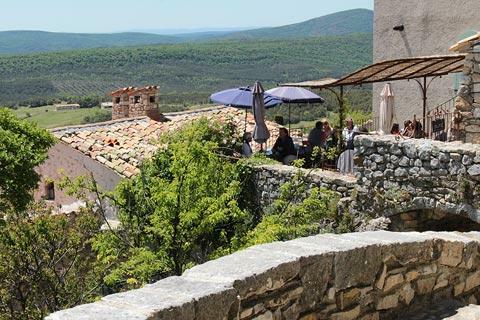 We didn't notice any shops in Bargeme, but there were two or three small cafes with terraces having views across the countryside. 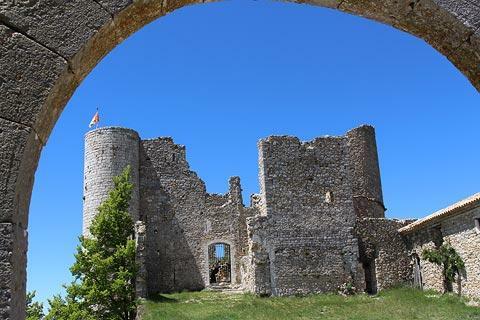 At the highest point in Bargeme stands the imposing medieval Chateau de Sabran de Pontaves, built in the 13th century and around which the village subsequently developed. 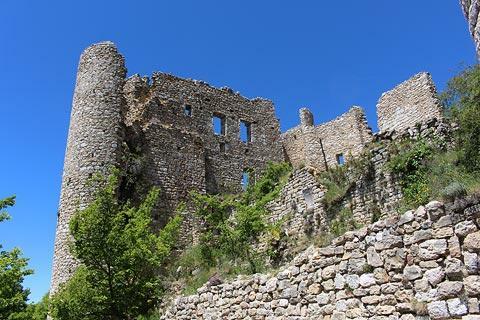 Although the castle is now in ruins, in part due to damage during the Wars of Religion, a good part of the main building remains and the substantial walls and towers of the castle still evocatively dominate the village skyline. Visitors can explore the ruins without paying. Another religious monument of interest in Bargème is the little 17th century Chapel Notre-Dame-des-Sept-Douleurs, north-west of the village at Saint-Laurent. 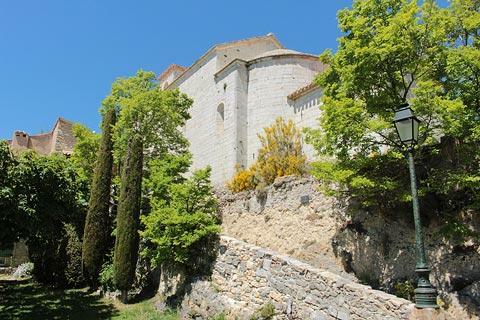 Close to Bargeme you can see the scenic gorges de l'Artuby, and there is a charming ancient bridge at La Souche. A tourist information panel in Bargeme suggests a route through the nearby villages of La Roque-Escaplon, La Bastide, La Martre, Chateauvieux, Brenon, Le Bourguet, Trigance and Comps-sur-Artuby. We have not visited all of these but can certainly recommend Trigance, to the west of here. 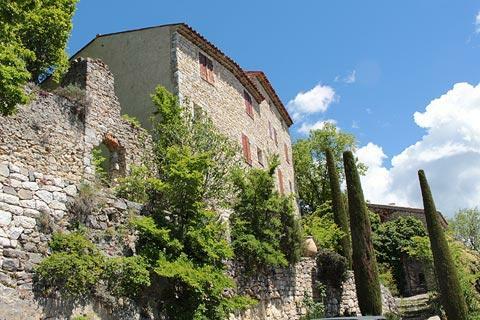 The imposing Gorges du Verdon are the main attraction in the region, and Bargème is often visited as part of a tour of the region centred around the gorges.